Our hunting area is in WMU 525 right in the heart of great mule deer country where the big bucks live. We're blessed with a bountiful supply of trophy bucks along logging and oil company roads. There is abundant clover along the hunting trails, a top quality food source, providing you a trophy mule deer showroom and an exciting hunt. Our success rates continue to remain one of the highest and provides bucks to record book scores. 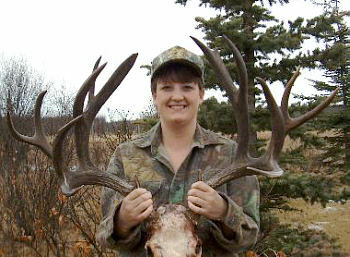 Our Alberta mule deer hunts are done by vehicle and spot and stalk. When the trophy of your choice is located we may find it necessary to stalk the deer or to occupy a stand near its feeding location early the next day. During the rut we may use rattling and a rut tube to draw the bucks to you. We prefer to hunt these trophy deer at two separate times. Our first preference is hunting during the first three weeks of rifle season, when the bucks have not been hunted and are feeding heavily on the roadsides and back trails. Our second preference is hunting from mid October through mid November when the larger mule deer are rutting and still feeding in the hayfields and along clover line in the woods. For your next Alberta mule deer hunting trip contact Louis Shilka at Alberta Wilderness Adventures and we will do everything we can to put you on the trophy mule deer of your dreams. 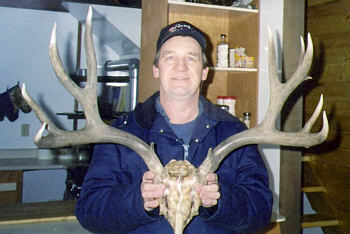 An impressive 29 inches of heavy beamed antler. 12 points of polished tips are a rare sight with mule deer. 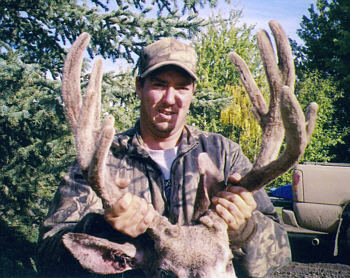 This Mule Deer is an exceptionally heavy beamed deer with a 28" spread and sporting 6 points per side.